Now I’ve got a family of my own and I work in the shipping container industry. My duties are mostly technical but I’m also responsible for most of our company’s online endeavors, which involves quite a bit of reading and research. In my hours spent digging through articles and blog posts there are a few things that come up quite regularly. One of them is the idea of burying a shipping container to use as a shelter or storage space. I’ve heard a lot of stories about things like this, some in articles posted on the Internet, some in forum discussions, and a few tales even passed around the office. Using my what I’ve learned from my research, the knowledge of the 25+ years of combined industry experience I’m lucky enough to have here in my office, I’ve put together a few things that I think are important to know/do if you’re planning on buying a container and putting it in the ground. Lots of people get the idea to build a storm shelter or bunker by burying a shipping container – it’s fast, relatively inexpensive, and durable, right? Step 1) Dig a hole. Step 2) Put a shipping container in the hole. Step 3) Backfill around the container. And by now you can probably guess where this article is going. The latest example of what not to do showed up in the ContainerAuction.com email last night, and comes from an undisclosed location (for reasons of security and therefore insecurity). It appears to have originally been a solid 20′ container that the owner dropped it into an 8′ deep hole with the intention of burying it. As you can see from the pictures below, the weight of the ground caused the curb side walls of the container to buckle in (no idea of how the road side walls looks). The corner posts appear to still be straight, but it’s hard to tell without getting inside and looking around. Unfortunately, that could be hard as another issue that’s apparent in the pictures is a high water table, a topic that we haven’t discussed in the past. Rather than rehashing an article that we previously published about using Gabion baskets to bury a shipping container, we strongly recommend that if you’re going to bury a shipping container it’s good idea to reinforce the sides with Gabion baskets. They’re relatively inexpensive, and you can invite your friends over for a rock gathering party. If you need a new or used 20′ or 40′ container we’re more than happy to help you find one. If you want help burying it in the ground you’re on your own. To bury or not to bury… is that the question? Should you bury shipping containers for use as storage or living space? This argument has been around for quite a while and I would like to make it clear that I am neither for, nor against the idea. I am not writing this article to try to get you to bury or not bury your container. I am going to assume that you’ve done your research and decided that this is the best option for you. If you haven’t, there are plenty of resources out there. There are forums with 25 page discussions that escalate to borderline html/text warfare. There are websites full of videos of men with an accent that makes them somehow sound less pretentious, and there are articles, books, videos, etc… The decline in the economy combined with the increased availability of information over the Internet has brought about an entire culture of do-it-yourselfers intent on navigating their own way through sometimes perilous paths for a multitude of their own reasons. Don’t get me wrong, I will always attempt something on my own before I ask for help but in the event that I get to a point where I feel that I no longer understand what I’m doing, or am uncertain about any decision I have made – I seek advice from someone who knows more than I do and depending on the severity of the situation – a qualified expert. So let’s approach this question a different way. I am from a school of thought that assumes that anything that conforms to common sense and the laws of physics can be achieved or manifested in some form. So if I wanted to bury a cargo container to use as bunker, I wouldn’t be asking IF, I would be asking HOW. 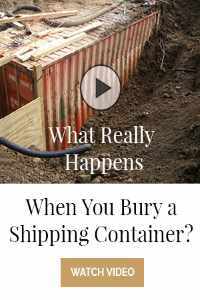 Because let’s face it, it’s been done (you’ll see this video on almost every single site that has a reference to burying a container.) Let’s assume that you’ve made up your mind: You’re going to bury the box. Here is the question: Are you able/qualified to bury a shipping container for use as storage or living space? I will be the first to admit that I am not. I am not confident, nor am I comfortable enough with my understanding of underground construction or the way that the forces of the world work to invest time, money, my life or the lives of my family in burying a shipping container for use as storage or living space. I could market the project once it was finished. I could even build you a mediocre, fairly entry level, WordPress blog/webpage about it. Or write you a 7 minute jam track song with a basic drum beat, 3 guitar solos, and some crazy programmed percussion about it. I mention that because those are things that I have studied or spent time doing. I don’t consider myself an expert in any of those fields but at one point or another I have fixed a 404 error, or played a Phrygian scale over a C# chord and then cashed checks as a result of it. My point here: Do the research, make informed decisions, and ask for help when you need it. The next thing to consider is your project. I obviously can’t account for all of the variables in a project like this. I won’t be talking about the depth you should bury or how to reinforce your ISO container (which I think is must,) or the type of materials you should use when building. Like I said – I don’t know anything about underground construction and don’t intend to give bad advice so I’m not going to write about any of that. I will write about a few of the factors in the decision to use a shipping or cargo container as an underground bunker. Cost and convenience are two of the biggest. Cargo containers may be abundant in your area or you may already have one lying around, or some other reason may make a shipping container an obvious choice for you. 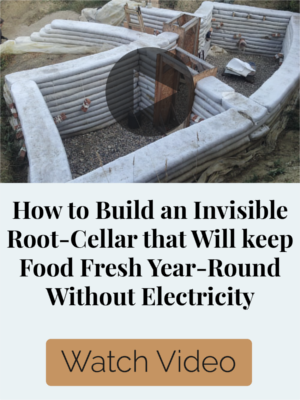 You may have some experience working with them or be caught in the trend, but for whatever reason: you’re looking for advice on how to bury a shipping container underground for use as a bunker or storage. Most shipping containers are made from Corten steel. Corten steel (also called “weathering steel”) is a strong steel alloy that is extremely rust resistant, if the paint on a container (also rust resistant) is damaged the exposed area will develop a thick oxide film that prevents it from rusting any further. Combined with the correct paint this makes them stand the test of time against the harsh conditions experienced during travel at sea. The doors seal making them wind and water tight and allowing them to effectively protect their cargo. A 20’ container on its own weighs around 5,000 lbs and is designed to hold up to 60,000 lbs worth of cargo while stacked up to 9 high. This seems like a tough, perfectly sound structure that could easily hold up a couple feet of dirt, right?If it were only that simple. The strength of these containers comes from the frame. Corrugated sides are helpful and corten steel is strong, but the sides of a container are only a few millimeter thick. They are slightly recessed so when the containers are loaded onto a truck, train, or stacked, the frame is the only part that actually makes contact with anything around it. The best analogy I have heard for this is a soda can. A soda can will support the weight of a grown man standing on it, or the weight of many cans stacked on top. But it only takes a very slight amount of pressure to the side of the can to cause it to flatten under his weight, or topple the stack. Also, if the can is dented or damaged before you start the experiment it will also yield the same result. The shapes of these two objects are different but the physics are relatively similar. Outside of the frame which is a very small part of the surface of the container, these boxes just aren’t designed to withstand constant force from all directions. This is why it is important to choose your container with care, a solid container is the difference between success… and just digging a hole and filling it up with money. Just as with most other products or services — you get what you pay for. There are always exceptions but as a general rule, if you want quality… you pay for it. Cargo containers ride back and forth between continents on big ships in mostly open, salty air and though they have been coated with a special rust resistant paint no amount of metal, or colored goop accounts for damage that may occur during their travels, or just plain age. The tiniest hole from the smallest ding or rust spot could end up being your worst enemy if you plan to use your container as a storage or living space. I’ve seen gallons of water leak through a pinhole in the ceiling of a container over just a few days time. If price isn’t an issue, get a new one. You can often choose your color or even apply some sort of logo. However if you’re planning to put something underground, color probably isn’t an issue. There are also what are called 1-trippers. These are almost new containers that have been loaded at their point of origin and brought into a port and then unloaded. So in essence, someone else is paying for the trip over. I tend to think of it like buying a new car. The dealer drives the car before you buy it, salesmen take it on test drives and move it around the lot.. etc.. In this case just imagine that he drove it to the store and used it to bring home his groceries. 1-trippers are common in the containerized housing community and are relatively easy to acquire. They are rarely damaged and are almost always in near perfect condition. If you’re on a tighter budget there are used containers. Different companies tend to refer to different conditions in different ways. I work for a company that doesn’t deal in junk, so most of what we see in the used category is referred to as “Wind and Water Tight.” This means that the doors close to form a seal and the floor and walls all remain in good shape. If you were to stand inside one of these containers and have someone close the door (which is a great way to check out a container by the way) you would see absolutely nothing. No light, no moving air, just black. Wind and Water Tight might mean a few years old, a little rust and a few bumps and dings but nothing that would affect the structural integrity or its ability to protect cargo the way it was designed to do. They can be inspected professionally and certified as worthy but often this is just an added expense (usually passed onto the buyer by the dealer) so most people opt to inspect it themselves. Beyond that there are As-is containers, what you see is what you get. You may have some rust to sand, or a hole to patch, but if you’ve got the skills and the time it’s another way to save some money. Keep in mind that damage in the right area can affect the structural integrity of the unit, and its ability to stand up to the elements, so it’s always a good idea (especially when burying a container) to consult and engineer, architect, or just someone who knows about these sort of things to make sure that the unit is able to withstand whatever torture you have planned for it. One of the most important parts of this process, second only to the container itself. As previously discussed shipping containers are not designed to withstand constant pressure on the side/top panels. 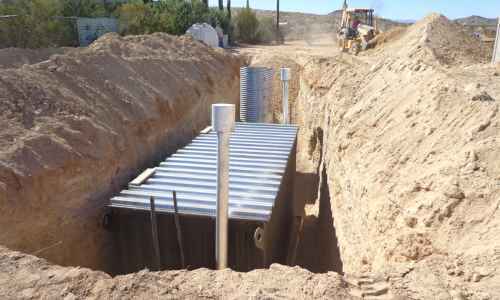 Burying a shipping container successfully involves properly engineering your structure to withstand the amount of pressure exerted by however much dirt you plan to have around it. It may just be a few inches, or it may be a few feet. No matter what your plans the sides and roof of the container should be properly reinforced in the manner of your choosing to prevent accident or injury. You may choose wood framing, or bricks, or even cement but you must choose something. If you’re not sure hire an engineer or architect. It will be worth the extra bucks when your shelter is still there after the ground shifts from an earthquake or the next big rain. If you’re building a structure to keep you or your stuff safe, why take any chances? This is another thing that might be easy to overlook but could end up being crucial to your project. Though corten steel is rust resistant neither the paint that is on the cargo container nor the metal are designed to withstand the effects of standing water or whatever other potentially corrosive factors hide in your soil. What things should you consider when looking into paint/sealant? Quality, durability, and chemical composition, I will not comment on the type you should or shouldn’t use because there are different schools of thought here. However you do want to ensure that you have successfully protected your surfaces from wandering streams of water and whatever other negative effects soil and ground moisture can have on your container. The very last things to consider are the potential toxins that come with the territory. Both the floor and the paint could potentially hold toxic chemicals, whether they were used to treat the surfaces at the point of origin or to fumigate the cargo in transit, pesticides are definitely something to consider when you intend to live or store things in a cargo container. Australia has some pretty strict pest control regulations and let’s face it…There are millions of shipping containers out there and who has the time to track which ones have been where, so everybody fumigates to Australian standards. This leaves pesticides trapped in the wood of the floors and leaves the possibility of potentially harmful vapors being released over time. There are a few ways to deal with the paint and floors when it comes to this. Rip it out! You could tear out the entire floor (or in case of the paint, sand it) and replace it with something a little more safe and aesthetically pleasing. Or you can seal it in with an epoxy or some other carefully chosen paint/sealant that doesn’t have harmful characteristics. The original toxins can be identified using the placard on the outside of container. This carries the codes of most of the specs of the container including which pesticides were used to treat the floors and the type of paint used on the other surfaces. Consult this and then decide how to proceed from there. There are numerous forums and articles based on this subject and a simple internet search will result in quite of bit of information about the subject. The very reason for this post… Above all, be safe when working or playing. You are presumably building something like this for protection or safety, so take the time to make sure that it does you no harm! Choose your container carefully, ask for help when you need it and if necessary consult a qualified professional engineer (or architect) throughout the phases of your construction. Remember to reinforce your structure where needed, and remove/encapsulate any potentially hazardous residue from the units previous life. Another Conservative Voice Choked Out?